It’s still pretty cold outside to avoid wearing anything but a full coat, but on Friday since we’re mostly just running out of the car and into the grocery store I’ll take just a sweatshirt and try it out! 🙂 Rae got to ride in it for a few minutes today and loved it. 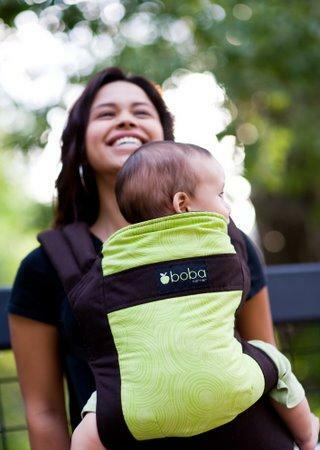 The nice high back keeps her up straight and close and snug to mama. 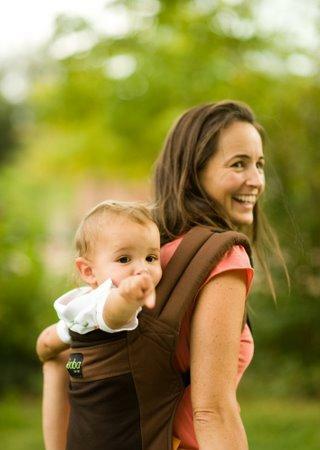 And the straps and structure of the carrier are so nice, leaves the Snugli and the BabyBjorn in the dust! The color shown here is Pine, it’s also the one we chose and I think looks even nicer in person. 🙂 We’ll hopefully have some photos of Rae and me next week with our new boba! The adjustments were super easy to make and I put it on quickly and easy, straight out of the box. It’s super easy to adjust for size and it grows right along with Rae as well. It can be used with 1-4 year olds and while Rae is a little tiny at the moment, she fits, is cozy, and has plenty of room to grow, lol. I’m tempted to put Dunc in it, just to try out the full 4-year-old capacity. Which wouldn’t really be a problem except that I don’t think he’d ever want to walk again, and I don’t think my back could take that, lol.